Not many people get excited about fossil algae, but here’s one that is impressive in many ways. This is “Solenopora” jurassica Nicholson in Brown, 1894 (Rhodophyta, Rhodophyceae, “Solenoporaceae”) from the Jurassic of England, a spectacular fossil red alga with its pinkish-red pigmentation still preserved. It’s encased in a matrix of fossiliferous packstone from the White Limestone Formation. 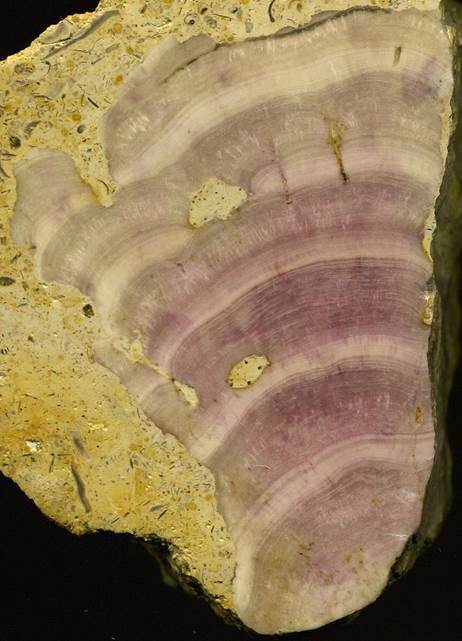 Pinkish-colored specimens of this fossil red algae form such a distinct interval that samples are called “beetroot stones”. Stratigraphy: White Limestone Formation, Great Oolite Series, Bathonian Stage, upper Middle Jurassic, ~165-168 million years. “Solenopora” jurassica fossil red algae (5.9 cm tall) preserved with reddish-pink coloration. From the Middle Jurassic-aged White Limestone Fm. in the Cotswold Hills of southern Britain. Since this fossil rhodophyte is still pink-colored, I wonder if identifiable biomarkers are preserved and detectable? Some fossil red algae identified as “Solenopora” from Middle Ordovician limestones of the Quebec City area in southeastern Canada have preserved pigmentation as well, though it’s a deeper red color, but it’s only present in the “Solenopora” specimens. The reddish-pinkish pigmentations in British Jurassic & Quebec Ordovician specimens have been observed to fade with time.